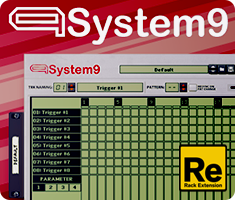 System 9 Pattern Sequencer is our powerful multiple pattern sequencer for Reason. providing features and functionality, previously unavailable in Reason. 3Plex 3x Line Filter Delay offers 3 true stereo filter delay units, 3 LFOs for modulation purposes, 3 dedicated AHD Envelopes, Bus Setup function to control the way the delay lines are connected plus many more features. Quadelectra BeatChop is your ultimate solution for realtime audio manipulation. From simple beat repeats, to stutters, glitches, tape stops and scratching. Handle your realtime audio with surgical precision.